This new marmalade cat started showing up about a week ago, and every time I’ve seen him he has always been lying in the same sunny spot in the neighbour’s yard. He’s very shy and won’t let you approach, but he seems agreeable enough. If you talk nice to him he’ll do “nice eyes,” to show you he likes it. I guess he’s just an older cat looking to lie in the sun and not bother anyone. The squirrels don’t like him at all though, and every time they notice him one of them will start making an alarm call. Sometimes others will join in until the yard is a chorus of agitated squirrels flicking their tails and scolding. This can go on for 10 minutes. The cat doesn’t care and goes on lying there, and eventually the squirrels go back to what they were doing. There are plenty of other cats in the neighbourhood, but the squirrels don’t seem to mind them if they are familiar cats. For example the other neighbours have a cat, pictured here, and they can feed the squirrels on their porch with Socks lying a few feet away . One time, a squirrel even jumped onto and over the cat, when he was in the way of a treat it wanted to retrieve. This isn’t the first time we have noticed this. 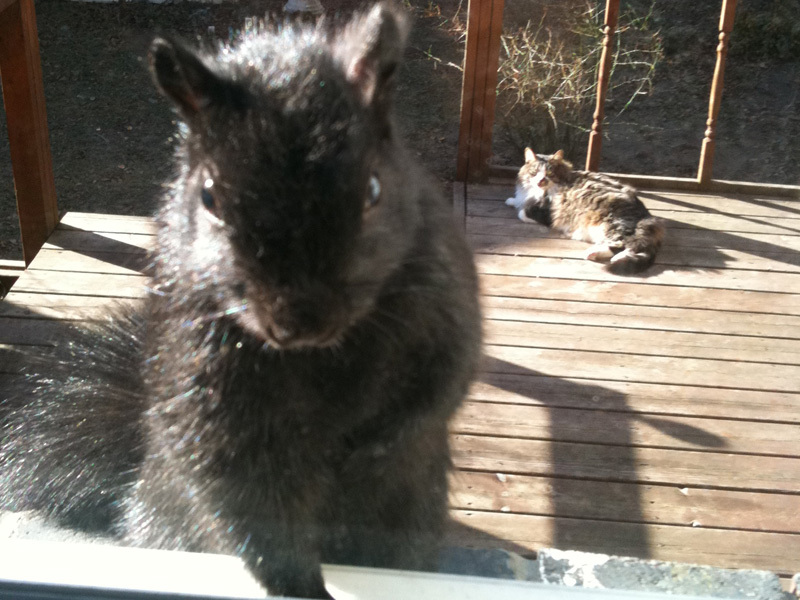 We had a cat at the house for a few months, and I remember when it got out that the squirrels went nuts then too. 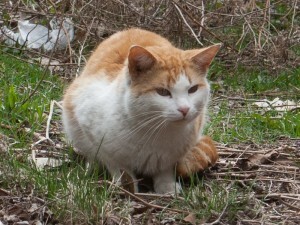 It looks as though squirrels can recognize individual cats. Maybe they can even tell individual humans apart. This entry was posted in Meet the Locals. Bookmark the permalink.